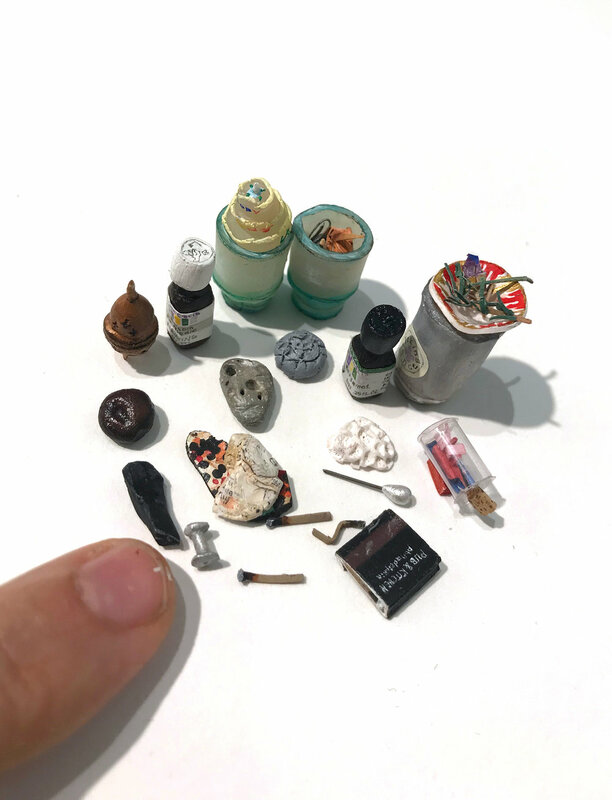 Rachel Grobstein’s labor-intensive process of miniature painting and sculpture is intended to create intimacy and slow down the act of seeing by representing objects that are commonly overlooked. She often installs her work directly onto the wall with pins, creating a subtle architecture of shadows and playfully referencing natural specimens. Recent work takes the form of visual inventories, suggesting the pathos of creating order from fragments of endless lists. Since coming to Roswell, Grobstein has begun a series of miniature tableaus based on objects on peoples’ bedside tables. She began by asking friends to send pictures of their nightstands from home, but lately she has expanded the series to include a wide circle of people in Roswell. Grobstein has long been interested in the way personal collections create snapshot biographies, and she became especially fascinated by the array of objects on nightstands: detritus like tissues and the day’s receipts get jumbled with mementos, novels and prescriptions.